By re-imagining DNA as a building block, a new generation of researchers is exploring ways to better understand proteins, craft new medicines and even perform computations. Now, researchers are beginning to master the control of DNA shapes and zero in on practical applications. DNA origami structures, for example, might capture proteins so we could study how they work. They could deliver drugs to diseased tissues or the immune system, or even organize biomolecules to do computations or emit light. 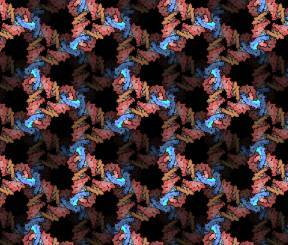 This past spring, Caltech held a symposium, Ten Years of DNA Origami , to assess the state of DNA origami today. To discuss the progress and potential of this field, The Kavli Foundation brought together three research leaders who attended the symposium. Paul W. K. Rothemund  – is a Research Professor of Bioengineering, Computing and Mathematical Sciences, and Computation and Neural Systems at California Institute of Technology. He is a MacArthur Fellow and a faculty member of the Kavli Nanoscience Institute . He is currently trying to integrate DNA origami with nanoscale electronics and photonics, and investigating RNA origami that can be produced biologically within living cells. William Shih  – is an Associate Professor of Biological Chemistry and Molecular Pharmacology, Harvard Medical School, and Associate Professor of Cancer Biology at the Dana-Farber Cancer Institute. He is also a core member of the Wyss Institute and leads the Biomolecular Nanotechnology Group. He is currently creating DNA-based molecular machines that can be used to study the structure of protein structures and develop new types of drugs. Shawn Douglas  – is an Assistant Professor of Cellular & Molecular Pharmacology at the University of California, San Francisco, School of Medicine. He developed CaDNAno , a software program that calculates how to build DNA origami shapes. He also currently leads BIOMOD , a student design competition using the molecules of life. The following is an edited transcript of a recent roundtable discussion. The participants have been provided the opportunity to amend or edit their remarks. What has surprised you about working with DNA origami? Are there practical applications for this technology? Can we make nanorobots out of DNA? What are the barriers to achieving that vision? What is the goal of BIOMOD, your student DNA "hacking" competition? What do you think you'll be working on in 10 years? THE KAVLI FOUNDATION: My first question is about the name. Why "DNA origami"? PAUL ROTHEMUND: The name is based on an analogy to paper origami. As my Japanese colleagues have pointed out, it literally translates as “DNA folding paper,” so it's not very accurate. But it does evoke the idea of starting with a simple object, a square of paper pregnant with possibilities, that we could fold into any shape we might want. There is one meaningful difference. Paper origami requires someone to fold it. In DNA origami, we're setting up a long strand of DNA with a bunch of small DNA strands, or staples, that enable it to self-assemble into the shape we want. Some people think we are using little micromanipulators and somehow tucking, folding and creasing DNA to build these things. No. All it takes is a simple change in temperature and it happens automatically. TKF: It has been 10 years since those DNA origami smiley faces appeared on the cover of Nature. During that time, what's the most surprising thing you've learned from working with DNA origami? WILLIAM SHIH: I am continually humbled by what dogmas are wrong. To get anything done, you need to start with some working assumptions. It's easy to feel those arbitrary conventions are real and binding. First, Ned Seeman taught us to shape DNA by following a rigid set of rules about where to place repeating chemical sequences. That blew my mind. Then Paul's work showed that you didn't need to design any sequences or even purify the resulting strands, and that blew my mind. Now, other researchers are challenging Paul's work, showing that you don't really need to start with a long strand of DNA. For me, the lesson is that the power and versatility of DNA self-assembly will continue to surprise us, and we'll keep finding new design rules. I'm sure of it. SHAWN DOUGLAS: I'll echo that point. I've been surprised by how many things work. I was perfectly spoiled as William's first grad student, because we got our first origami structures to fold after only a few months. Most research this powerful takes years and years to develop. It shocks me to think how lucky I was to be part of that. As the blueprint of life, DNA always attracted scientific attention. In the 1980s, however, Nadrian ("Ned") Seeman, a professor of chemistry at New York University, had a flash of insight. He realized that if he could design and synthesize long chains of DNA properly, they would self-assemble into precise, repeatable nanostructures. Why did it matter? After all, DNA lacks many of the properties most attractive to chemists: It is neither electrically, optically nor chemically active. Yet DNA is large enough to hold and organize other molecules with those, and other, desirable properties, the way a circuit board integrates many different types of electrical components. Seeman’s work was the birth of DNA nanotechnology, for which he won a Kavli Prize in Nanoscience in 2010 . Yet his method for synthesizing DNA-based structures was slow and prone to error. It was Paul Rothemund, a professor at the California Institute of Technology, who found a way to build with DNA that was simpler and 100 times faster than Seeman’s method. Rothemund started with an existing long strand of DNA and synthesized only short strands of DNA, called staples, which he used to bind the long strand in different spots. This enabled him to twist, turn, and loop DNA to form the desired shape. ROTHEMUND: A couple of things are mind-blowing. On a personal level, I don't think we actually know what DNA is. By that, I mean each one of us is running around with this picture of what DNA can and cannot do, and it’s totally wrong. The picture that each one of us is entertaining is missing something. That's why DNA self-assembly keeps surprising us, because our picture is this total cartoon compared with DNA’s real capabilities. The other thing that surprises me is how researchers use atomic force microscopy  or electron microscopy to create images of DNA. I routinely have this very visceral sense of disbelief when I see those images, especially when the pictures are beautiful. It's like, "God, those are just so pretty. I can't believe that it’s true." DOUGLAS: It's totally addictive. Just seeing those images is great, but to build one yourself and then see it—that's even better. Then you just want to do it again and again. ROTHEMUND: It's totally like that. William, Shawn, you must have read Neil Stephenson's The Diamond Age. It's a science-fiction story about nanotechnology written about 20 years ago. There's a scene in the book where someone uses a computer-aided design [CAD] tool to design and build complex nanomachines. For me to be spending my lifetime helping to make that vision real using Shawn's CaDNAno tool makes me feel like that fantasy is becoming a reality. It's really wild. TKF: We’ve come a long way in 10 years. Are there practical applications for DNA origami in biology, medicine or the physical sciences that researchers hope to advance over the next 10 years? DOUGLAS: Well, Ned Seeman, the father of DNA nanotechnology, originally conceived of it as a tool for visualizing proteins, RNA and DNA so he could study their shapes and see how they worked. Most proteins are very difficult to crystallize, which is necessary to study their 3D structure. His idea was to shape DNA so it could host a protein, then image it using X-ray crystallography. Today, we would use cryo-electron microscopy, or cryo-EM, which lets us visualize the detailed structure of large molecules. But individual proteins, DNA and RNA are so small and have such low contrast, they remain almost invisible. They look like background noise. TKF: How would DNA origami help? DOUGLAS: We would like to build DNA origami cages to hold those small proteins. The cages are maybe 50 times bigger than the proteins, and very easy to identify using a microscope. Within those cages, we know exactly where the protein should be, and we can use that information to solve the three-dimentional structure of the protein. TKF: And once you know that, what could you do? DOUGLAS: Well, there are open questions about how certain proteins and RNA complexes work. A molecule's shape encodes its function. This is the starting point of biophysics, and it would help us understand how these molecules interact with other molecules. TKF: What about you, Paul? Where do you see promising applications for DNA origami? ROTHEMUND: Like Shawn, I'm also extraordinarily excited about the application of DNA origami in biophysics. But let me talk about something different: creating molecular machines or nanoelectronics that involve integrating functional molecules with microfabrication. Let me back up. We have this picture of nanotechnology from Eric Drexler, an early popularizer of the field. It involves these amazing little mechanical machines, and for many people, that's what nanotechnology is. Others have suggested replacing the thousands of silicon atoms that make up a computer chip's transistors or diodes with single molecules. They believe we can make molecular electronics—and machinery—if we could manipulate and organize molecules efficiently. Now, chemists can already build many of the molecules we would need to do this. So why don't we have molecular machines or nanoelectronics yet? There's something missing, and I think it's the ability to organize these molecules into larger systems. DNA origami can play that role by letting us put molecules where we want them. One promising use is in semiconductors. The newest computer chips have components that are smaller than 10 nanometers. That's not atomic size, but it's pretty close. These chips have billions of components. Our challenge is to find a way to integrate the fine structure of DNA origami with these complex computer chips that interface with the outside world. TKF: Researchers have been chasing molecular electronics for decades, and this sounds like an intriguing way to get there. What do you think, William? Where do you see DNA origami going? SHIH: I think Shawn's vision of using DNA origami for research is really exciting. It gives us an opportunity to both characterize biochemical structures, and also perturb them—rearrange and reorganize these molecules and the sites they react with—to tease out true cause and effect. Let's say we want to understand DNA replication. This is a very complex process, and it involves a large orchestra of molecules with many players. To really understand their roles, we want to silence some players or tie the conductor's left hand behind her back and see what happens to the performance. In molecular biology, we have some tools that can manipulate molecules, but they are not very precise. With DNA origami, however, we can create scaffolds with sites designed to hold different players in our molecular orchestra. Then we can rearrange the orchestra pit and see how that affects the performance. TKF: That is an interesting variety of issues to tackle over the next 10 years. What about further out into the future? SHIH: It's fun to look out beyond 10 years. Take Drexler's vision of nanomachines that compute, communicate, actuate and migrate. That's an exciting vision, if for nothing else than just the joy of figuring out the design rules for achieving those behaviors. We could also use those behaviors to build therapeutic devices to improve human health. That starts with understanding the advanced nanotechnology of the immune system. It is a baroque system with many different layers of defense. It patrols our body. It has an early response system and slower-acting defense. Its cells know how to signal their neighbors and migrate to where they are needed. They can ingest invaders, or analyze invading cells and viruses for weaknesses and secrete antibodies to attack them. It's striking how the immune system's complexity differs from conventional medicine. Existing drugs are based on small molecules. We can think of them as little wrenches that gum up the works of some process. The immune system does that, too, but it can also call on a much wider, more nuanced variety of weapons. If we want to rival the immune system in effectiveness, we must rival it in complexity. Maybe that can happen through nanorobots built out of DNA, or through synthetic biology, the reengineering of living cells. There could be multiple solutions to these problems, and I think DNA nanorobots is one promising avenue to explore. TKF: Could we make nanorobots with DNA origami? SHIH: We could make primitive ones, yes. DOUGLAS: To amplify William's point, technologies that augment our immune systems are among medicine's most successful inventions. Vaccines simply hand our immune system the information it needs—inactive or weakened invaders—so it can produce antibodies to protect us. Drugs based on antibodies actually mimic the immune system, binding with a specific part of an invader in order to kill it. If we can use DNA origami to design and self-assemble more sophisticated types of molecular tools, this approach should continue to yield positive results. ROTHEMUND: Let me take Shawn and William's idea one step further. Antibodies bind with invading molecules in atomically precise ways to neutralize them. But how do they know when to do this? One hypothesis is that cells communicate by using large-scale patterns of proteins on their surfaces. The way these proteins come together in groups signals a cell to attack or interact with other cells. DNA origami could allow us to arrange proteins in ways that give us access to the language of the immune system. This might make very sophisticated medicines possible. TKF: This sounds like an amazing future. What are the barriers to getting there? ROTHEMUND: Funding, time, and the iniquities of life. TKF: That's true for all academic research, isn't it? ROTHEMUND: Let me think about my reply for a moment. SHIH: I think that we're all opportunistic, so it makes sense for us to go after problems that we can solve sooner rather than later. For example, some therapeutic applications need lots of material. It might cost $1 million to make 1 gram of DNA nanorobots to kill a tumor. That's too expensive. So, in the meantime, let's go after something cheaper. Shawn mentioned vaccines. So why don't we use DNA origami to give the immune system a tiny little sniff of the disease—an inactivated invader or piece of virus—and let it do the heavy lifting of remembering that smell and attacking it in the body. The challenges we face should not impede us from driving research forward. We can already build complex structures that are good enough to tackle many of the challenges we've discussed, from visualizing and perturbing molecules to stimulating our immune system. ROTHEMUND: I agree with William, we should go for what works. But I also see some holes. For example, we can do lots of things by making DNA nanostructures in a test tube and applying them to cells. But there are many more things we could do by programming genes to make those structures within cells, where they could trigger an action. Lots of groups are working on making synthetic DNA and RNA structures, and they do not all use DNA origami methods. But there are so many challenges. For example, how do we determine what architecture to build? How do we control its geometry? How do we build something that doesn't block the cell's natural machinery? How do we protect it against the cell's immune system, which sees our DNA and RNA as an invading virus? How do we move it between the cell's different structures? TKF: How long might something like that take? ROTHEMUND: Those challenges will occupy people for several decades. DOUGLAS: Paul and I often try to compare computing with our field, which, if you think about it, involves programming biomolecules to self-assemble into whatever we want. We believe programmed biomolecules are going to be just as transformative. But what is the timescale we are talking about? We're certainly not in the modern networked smartphone era yet. So, are we in the 1940s, using flaky vacuum tubes rather than reliable transistors? Are we in the 1970s, building the first graphical interfaces? I actually think that we're very early, maybe the 1890s. But the infrastructure—biomolecular tools and computers—is in place to accelerate things very quickly. If we can build out the biology the way we built out electronics, we can create all these amazing and useful things. To do that, we really need to talk about people. For me, one of the grand challenges is finding ways to recruit more smart people to the field. I believe we can get their attention by showing them that we are developing tools that are powerful enough to solve some real problems. TKF: That leads us to my next question, which is about BIOMOD, a contest in which students use DNA and RNA to build robots, therapeutics and even molecular computers. Shawn, you're very involved in it. What’s this “DNA Hackathon” all about? DOUGLAS: BIOMOD is biomolecular design competition that's really a carbon copy of a very successful synthetic biology competition called iGEM. I think more than 25,000 people have competed in iGEM, since it was begun at MIT in 2004. TKF: Synthetic biology refers to the creation of biological systems that do not exist in nature, right? DOUGLAS: Right. We're aiming the BIOMOD competition at college students, because that's when many of them start thinking about what they want to do with their careers. My hope is to offer students some hands-on exposure to what it's actually like to be a researcher in DNA nanotechnology. I don't think that the lab exercises students do in biology and chemistry class authentically simulate research projects. Ordinarily, students repeat something that was very important historically. Real researchers, on the other hand, decide what they want to investigate and figure out how to pursue it. We want students to work on teams, decide a first approximation of their goals, and then figure out how far they can get. TKF: Have you met any of these participants in your graduate programs yet? DOUGLAS: Definitely. It's still early, and many of the thousand or so participants we’ve had to date are not yet ready for grad school. But we have recruited a handful of people to the field. SHIH: From my experience at Harvard, the excitement among incoming graduate students for synthetic biology and DNA nanotechnology grows stronger and stronger every year. I'm not sure how much of that is due to iGEM and BIOMOD, but I suspect they play a role. A sizable fraction of incoming graduate students is gravitating towards the very few synthetic biology labs that exist at Harvard Medical School. There's definitely a latent excitement about the ability to build things on the molecular scale. In the past, there was this cultural notion that it was a business that only weirdos did, that it didn't work and that it wasn't valuable. But take away those cultural residues and what's the difference between programming a molecule and programming a computer? Or, for that matter, what's the difference between molecular programming and organic chemistry, engineering or medicine, where we assume that building things is a good and valuable thing? ROTHEMUND: There really is a generational change. For a long time, people believed that evolution created things that we could never imagine creating. We treated them as sacred, and believed that we could never fruitfully modify them. TKF: It seems like science fiction, doesn’t it? And that leads to our final question: What do you think you'll be working on in five or 10 years? SHIH: One way to address that question is to look at the self-assembled DNA molecular machines I was working on 10 years ago and how that changed. Qualitatively, it's the same. I feel like we are on the frontier of knowledge in a field that we're very passionate about. So, we want to continue pushing the edge. Though the pace of change is faster than in many other biological fields, we're still in the earliest stages of discovery. There's so much to do, and I'd be surprised if I'm not working on the kinds of things that we've already discussed 10 years from now. "In DNA origami, we're setting up a long strand of DNA with a bunch of small DNA strands, or staples, that enable it to self-assemble into the shape we want." TKF: What about you, Shawn? Will you be focusing on molecules, computer software or something entirely different? DOUGLAS: I think I'll be developing software to accelerate whatever I find is moving too slowly, which is where CaDNAno, the software program I developed that calculates how to build DNA origami shapes, came from. I'm currently very excited about the future prospects of virtual reality and augmented reality to improve scientific training and communication. It would help move forward all the molecular programming goals we discussed today. ROTHEMUND: I think William is 100 percent right. We'll still be elaborating the best ways to manufacture these structures in a cell rather than in a test tube, I think. I've been trying to do that for 10 years, and I think I'll still be doing that 10 years from now. And I'll still be trying, hopefully, to convince an ever growing number of physicists, applied physicists, electrical engineers and other engineers that it's worth incorporating DNA origami and other biomolecules into their tiny lasers, quantum computers and quantum memories. We'd like to make it less scary for them to use DNA, though convincing them one paper at a time may take decades.